We do our best. Sometimes though, our best just never feels good enough. There is always another lost soul, sad and without any other options, waiting. We see these dogs, failed by humans (whether intentional or not), and we just want to make all of the wrongs they have suffered right again. That’s the cycle of rescue. Each celebration is cut short by the next dog that needs to be saved. And these past few months have roared with so many lost souls waiting. 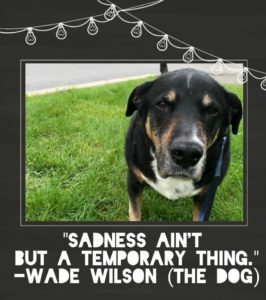 Recently we took in one of those lost souls; a sweet and gentle boy named Wade Wilson. He has eyes that immediately rob you of your heart and make you commit to loving him for all time. He must be some kind of magical creature because all beings respond to him in the same positive fashion. When we met, he was clearly unwell and we got to work on figuring out what was ailing this big guy. After many tests and a visit to a specialist, we found out one of his adrenal glands was not operating properly and was untimely sending him to the end of his life. Of course, we sought out solutions. The likelihood was cancer and a surgery to remove his delinquent gland could be curative. It was that or watch him degrade quickly and make the decision to end his life before suffering began. Not much of a choice, and with funds and hearts in hand, we opted for the surgery. Wade Wilson went in earlier this week for his surgery. Our budget was set, and we had no need to ask for help. But as all stories tend to go, not everything turned out as planned. Complications and difficulties meant this handsome beast may not make it. Once out of surgery, he crashed and needed a lot of medical intervention. He was able to be stabilized and is now thankfully doing much better but he had us and the vets scared for a good 24 hours. be paid, all of the complications and added care added up quickly. And so here we are. Wade is still not out of danger, still no appetite and looking down-trodden. He has hope in his eyes, but a struggle lies ahead. So we don’t know if Wade is going to make it, but we feel positive with his progress to date. We are committed to him and we are hoping against hope that Mr. Wilson here can cast his spell on all of you out there to skip your date night out this week, or your coffee quota for a few days, and instead devote your happy funds to saving the lovely life of a very lovely dog. We have the daunting task of looking these tossed aside animals in the eyes and telling them we will do our best. And this time, we really need our best to be a life saving thing – something we can do with your help. To donate: https://www.canadahelps.org/en/charities/sit-with-me-rescue/ and any donation of $20 or more will get you a charitable tax receipt. Or you can use paypal or email transfer to sitwithmerescue@gmail.com but please specify it is for Wade Wilson.